Search for the best flight prices from Manchester to Verona. Compare prices, book today and save money with Manchester Airport. Choosing where to go in this nation of soul-stirring cities, world famous art, and waist-expanding food and wine is likely to be your biggest problem. Verona, roughly midway between Venice and Lake Garda, should definitely be on your list. The city that inspired Romeo and Juliet is no work of fiction – it’s every bit as romantic as Shakespeare imagined. There are numerous palatial accommodation options in Verona, such as Palazzo Vittoria (Via Adua 8), with classically decorated rooms, Jacuzzis and marble bathrooms, or Hotel Colomba d'Oro (Via Carlo Cattaneo), with fantastic lavish rooms in a beautifully restored convent. There are charming choices for smaller budgets too, including Hotel Mastino (Corso Porta Nuova 16) in an attractive historic building, with rooms ranging from contemporary monochrome to grandiose gold, the smart Best Western Hotel de Capuleti (Via del Pontiere 26), with very stylish, contemporary rooms, and Hotel Marco Polo (Via di Sant'Antonio 21), another lovely Verona hotel in a converted convent. Verona is a lovely place to shop as well as sightsee, and the city’s main shopping streets are gracious Corso Porta Borsari and Via Mazzini. For high-end designer clothing for men and women, try Alkimia (Via Sant'Eufemia 9), while Macondo (Violo Scudo di Francia 7) stocks trendy local and international labels. A beautiful vintage perfumery is Profumeria Carlotta (Via Portici 5), which is a great place to find boutique scents made by off-the-radar labels. There is a colourful market (Piazza delle Erbe) with stalls selling clothes and fruit and vegetables in the centre from Monday to Saturday. UNESCO World Heritage Site Verona attracts plenty of tourists, but there are still many excellent, authentic places to eat the delicious, hearty cuisine of the Veneto. Famous local dishes include tagliata di manzo (thin slices of beef with rocket) and risotto all’Amarone (rice dish cooked with beef and local Amarone wine). Try these and more at places such as welcoming, good-value Hostaria La Vecchia Fontanina (Piazzetta Chiavica 5), with some innovative, creative dishes, traditional, venerable wine bar Antica Bottega del Vino (Vicolo Scudo di Francia 3a), which also serves impeccable local dishes, or down-to-earth, cheap-and-cheerful Osteria Al Carroarmato (Vicolo Gatto 2). Part of Verona’s carnival celebrations, this colourful parade with masked revellers culminates in a gathering in Piazza San Zeno, where gnocchi is served. Popular music festival featuring gigs and DJs, food stalls and festivities. Big-name bands, such as Two Door Cinema Club, the Killers and Franz Ferdinand, play at Villafranca di Verona. This weekend gastronomic festival has food stalls and stands occupying Verona’s beautiful main piazzas. You’ll find food from all over Italy and be able to indulge in tastings, observe demonstrations, and enjoy pairing the finest wines with the most delectable dishes. 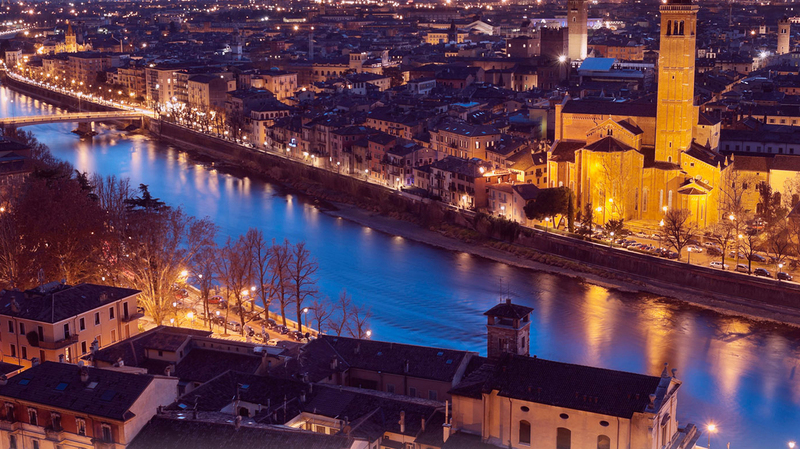 There are lots of cultural events in Verona over the summer, and during this highlight, major jazz stars play gigs in the gorgeous setting of the Roman amphitheatre, as well as Cortile Mercato Vecchio in the heart of the city. The world’s greatest opera festival, with performances of classic masterpieces, such as Tosca, Carmen or Aida, takes place in the wonderful, 2,000-year-old, acoustically splendid Roman amphitheatre in the centre of town.